LynchyRightNow: Week 3 Picks; Keep It Real! About those New England Patriots . . . be afraid, be kind of afraid. The Jets aren't the NFL's best team by a longshot, maybe even a bit over hyped (very over hyped) but the Patriots had a game plan and executed it to perfection last weekend. Even without Brady, this team is pretty stacked. Richard Seymour, Rodney Harrison, Deltha O'Neal, Adalius Thomas, the rookie Jerod Mayo, and Vince Wilfork, lead a vaunted Patriots defense of which Brady never played on. 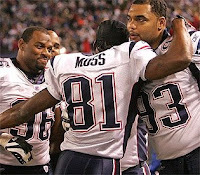 Veterans Wes Welker, Randy Moss, Jabar Gaffney, LaMont Jordan, Matt Light, and Kevin Faulk are all capable of making plays to help the young quarterback Matt Cassel. This team probably won't win the AFC title, but you can sure bet they'll factor into the playoffs and if things keep going the way they've gone so far for the San Diego Chargers, ask which team is in more trouble? 10-6, KEEP IT REAL! Good Afternoon You Toothless Goon. Hochuli may have made a big mistake on Sunday afternoon, but it isn't close to the mistake your mother made when she decided to birth you. 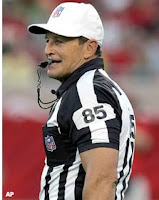 For starters, where do you get Ed Hochuli's e-mail address? I mean I'm not sure how that is public knowledge and even if it was, who looks it up? How boring is your life that you have to take quality time to look up an NFL referee's e-mail and write him some hate mail? I mean is there really nothing else that is going on in this world that isn't more important than that? I hope you are the same toothless goon who writes hate mail to the president as well, he's screwed up WAY more than a football game in September. Your a complete loser and should be sent to Siberia in my humble opinion of you. Hochuli owned up to his mistake, something you'll surely never do, AND he didn't even have to! HE OWES NOTHING TO THE FANS, ZERO! Next to Norv Turner, the only other person(s) he should have apologize to are the players and his boss, Roger Godell. Have a good life, and if you write any e-mail to me, I will do to them what Mr. Hochuli should have done: DELETE THEM YOU MORONS! KEEP IT REAL! NSLYNCH@GMAIL.COM, bring on the hate mail! O.J. will beat the kidnapping trial, how do you bet against him? USC v. the SEC Champ, just play it and give the trophy away now!